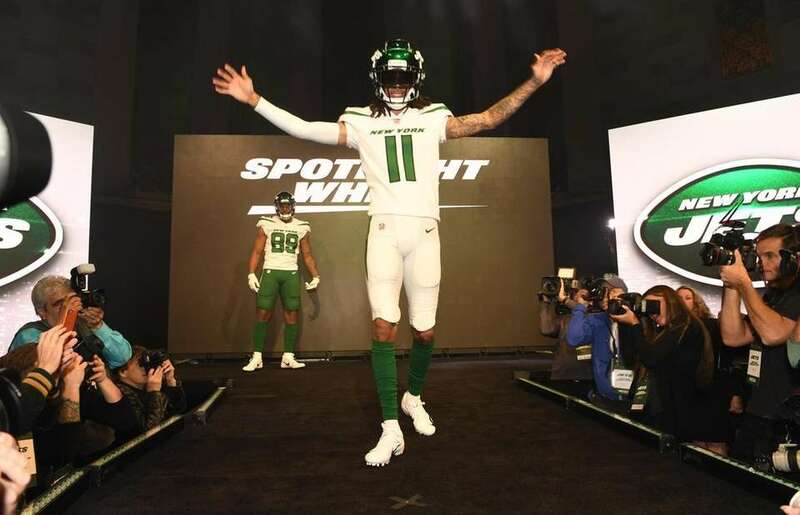 The team unveiled their brand-new uniforms and an updated logo at a special launch event in Manhattan on Thursday, April 4, 2019. 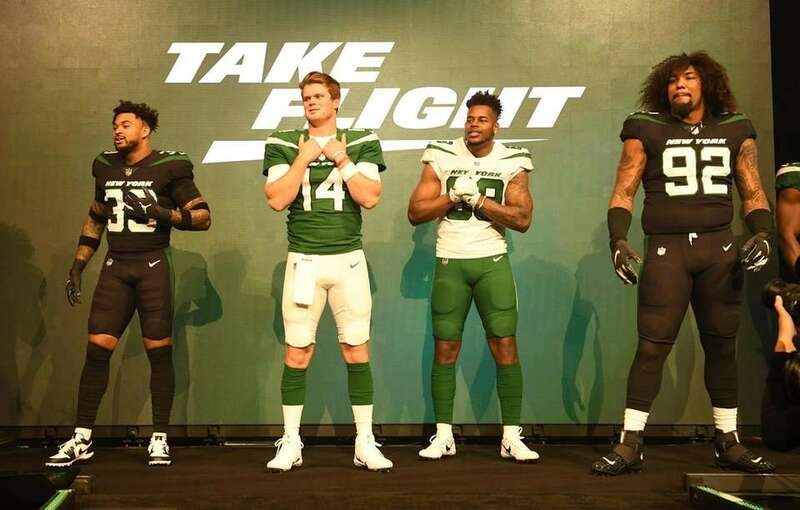 The Jets host a "Take Flight" new uniform event at Gotham Hall in New York City on Thursday, April 4, 2019. 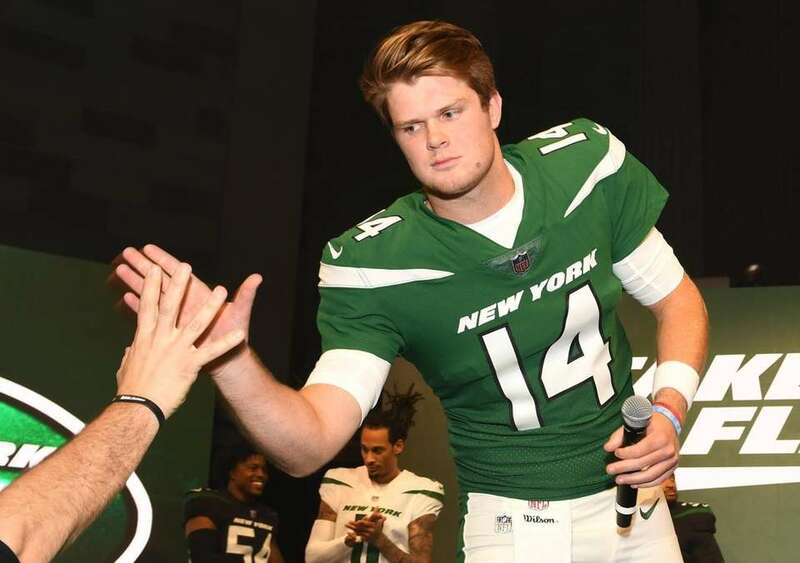 Jets quarterback Sam Darnold slaps five wearing the "Gotham Green" uniform at the New York Jets "Take Flight" new uniform event at Gotham Hall in New York City on Thursday, April 4, 2019. 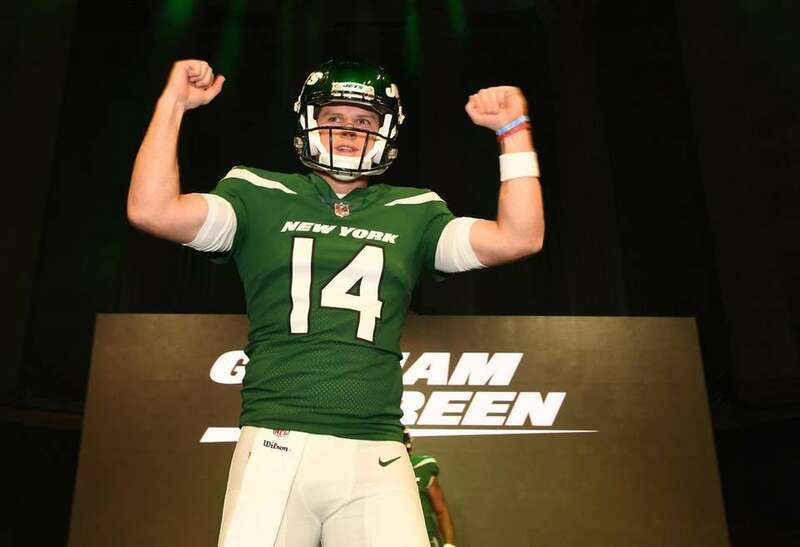 Jets quarterback Sam Darnold shows off the Gotham Green uniform at the New York Jets "Take Flight" new uniform event at Gotham Hall in New York City on Thursday, April 4, 2019. 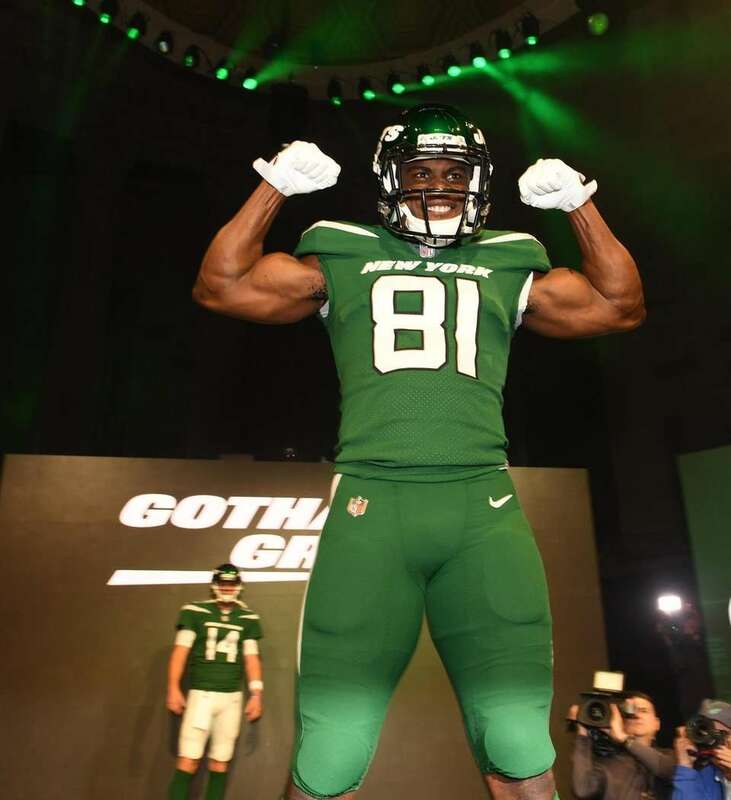 Jets wide receiver Quincy Enunwa shows off the Gotham Green uniform at the New York Jets "Take Flight" new uniform event at Gotham Hall in New York City on Thursday, April 4, 2019. 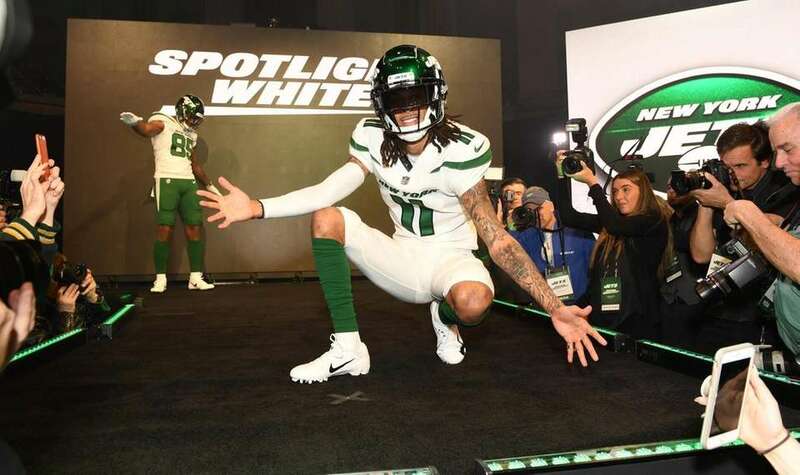 Jets wide receiver Robby Anderson shows off the "Spotlight White" uniform at the New York Jets "Take Flight" new uniform event at Gotham Hall in New York City on Thursday, April 4, 2019. 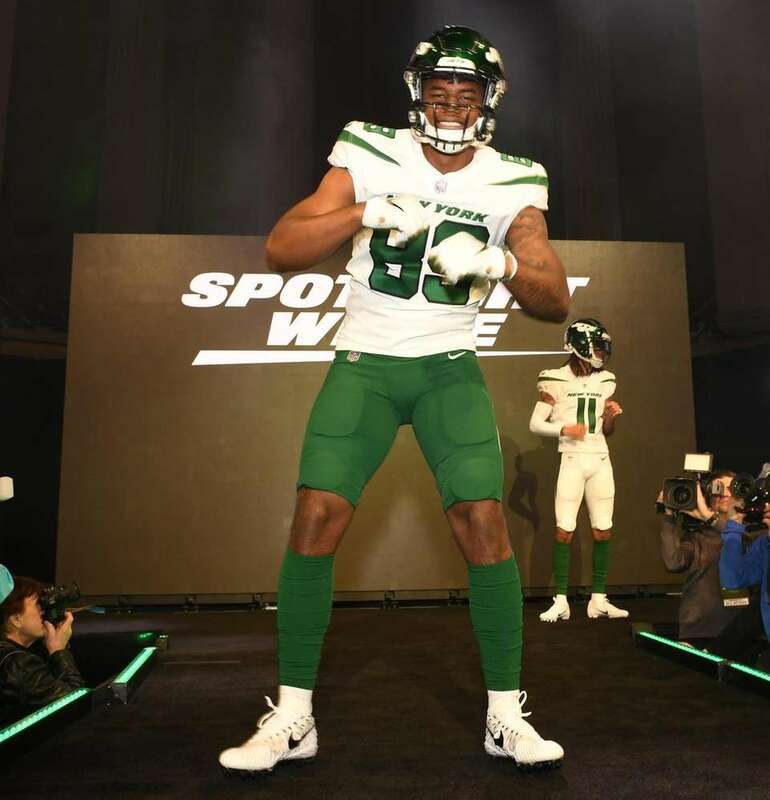 Jets tight end Chris Herndon shows of the "Spotlight White" uniform at the New York Jets "Take Flight" new uniform event at Gotham Hall in New York City on Thursday, April 4, 2019. 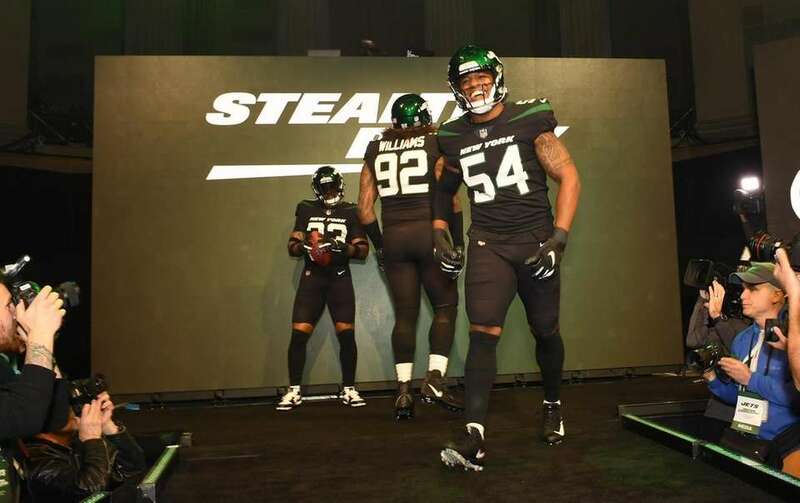 Jets players show off the "Stealth Black" uniforms at the New York Jets "Take Flight" new uniform event at Gotham Hall in New York City on Thursday, April 4, 2019. 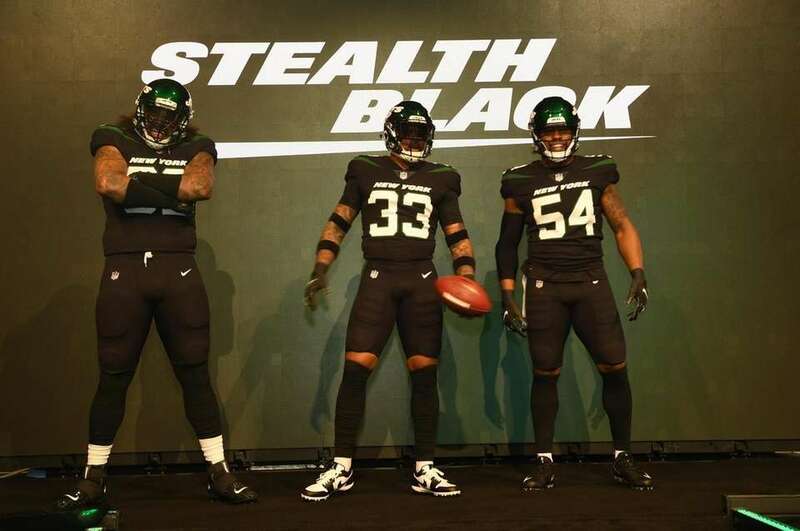 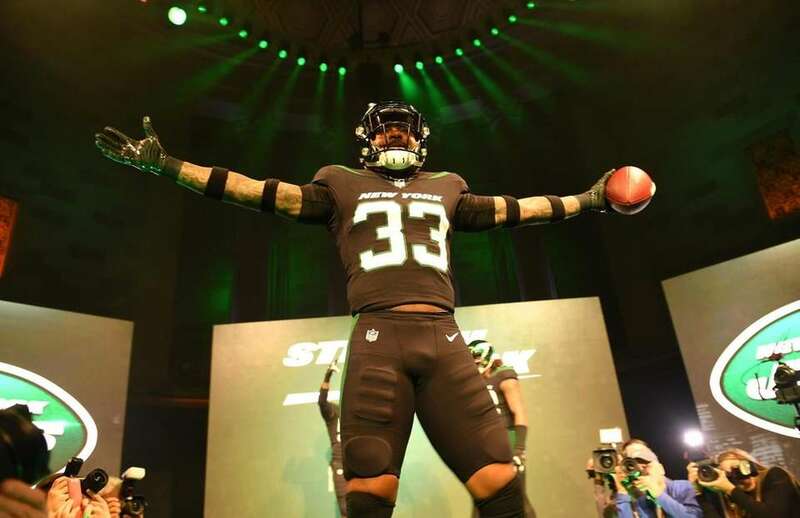 Jets safety Jamal Adams shows off the "Stealth Black" uniform at the New York Jets "Take Flight" new uniform event at Gotham Hall in New York City on Thursday, April 4, 2019. 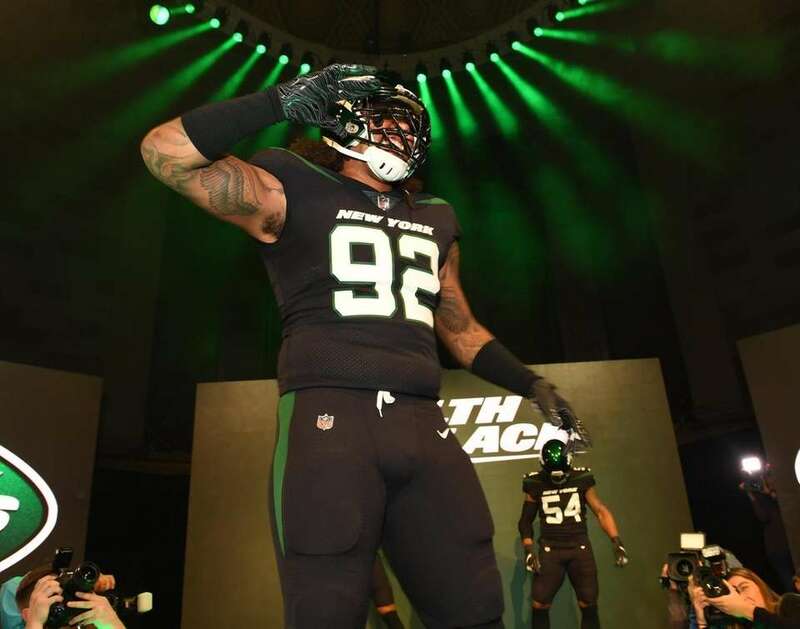 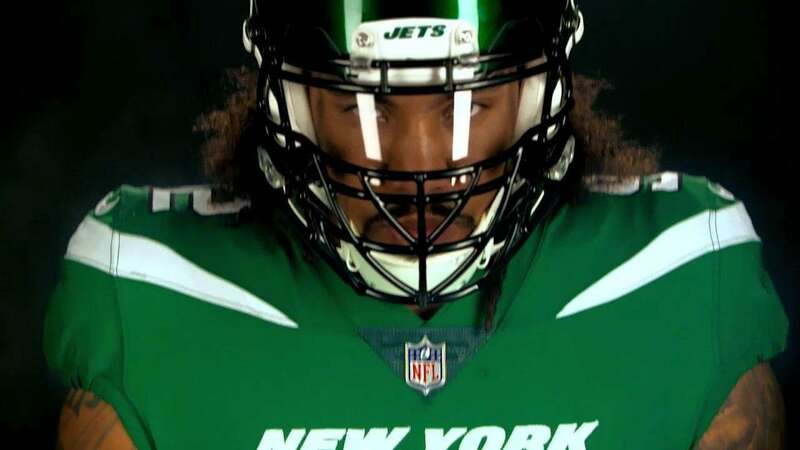 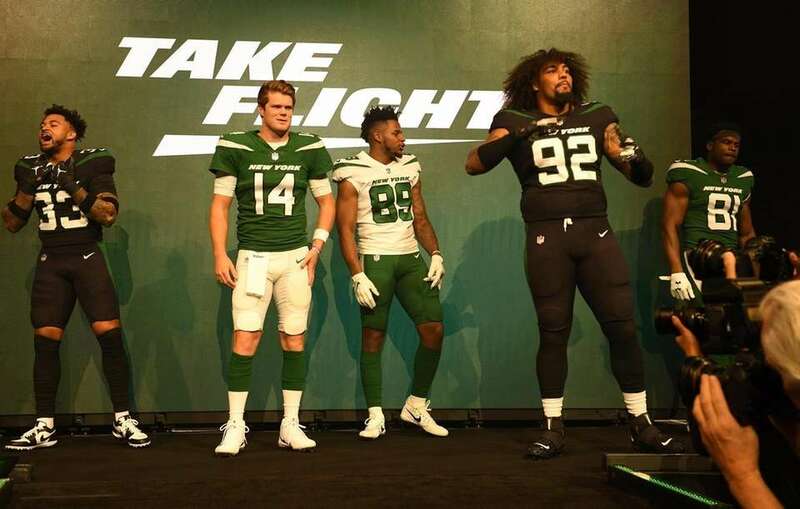 Jets defensive lineman Leonard Williams shows off the "Stealth Black" uniform at the New York Jets "Take Flight" new uniform event at Gotham Hall in New York City on Thursday, April 4, 2019. 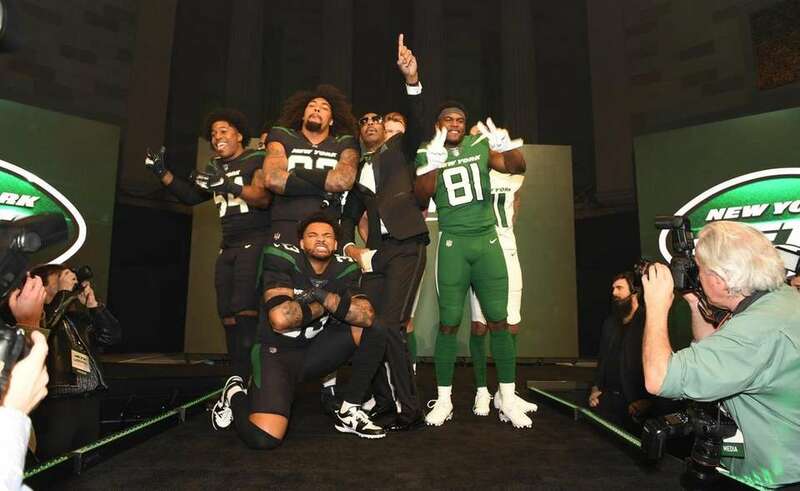 Jets players show off the "Gotham Green, Spotlight White and Stealth Black" uniforms at the New York Jets "Take Flight" new uniform event at Gotham Hall in New York City on Thursday, April 4, 2019. 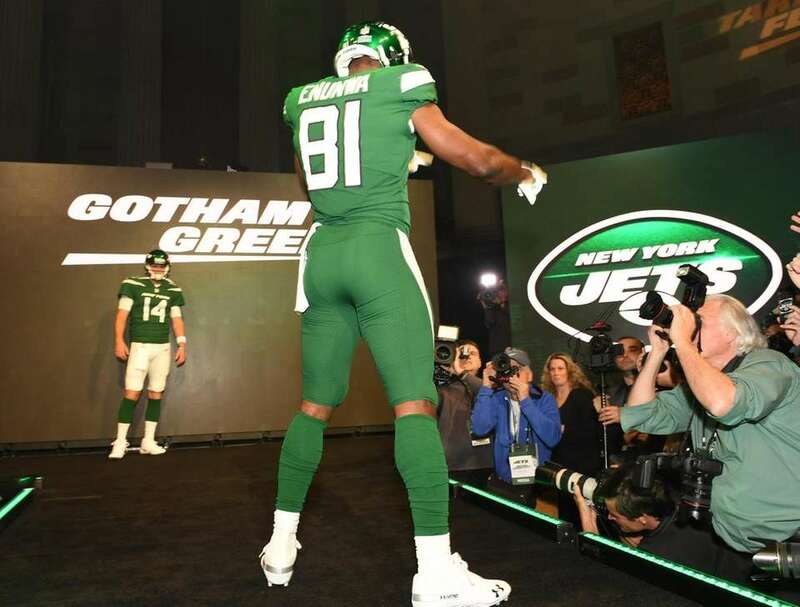 Jets players show off the "Gotham Green, Spotlight White and Stealth Black" uniforms at the New York Jets "Take Flight" new uniform event at Gotham Hall in New York City on Thursday, April 4, 2019. 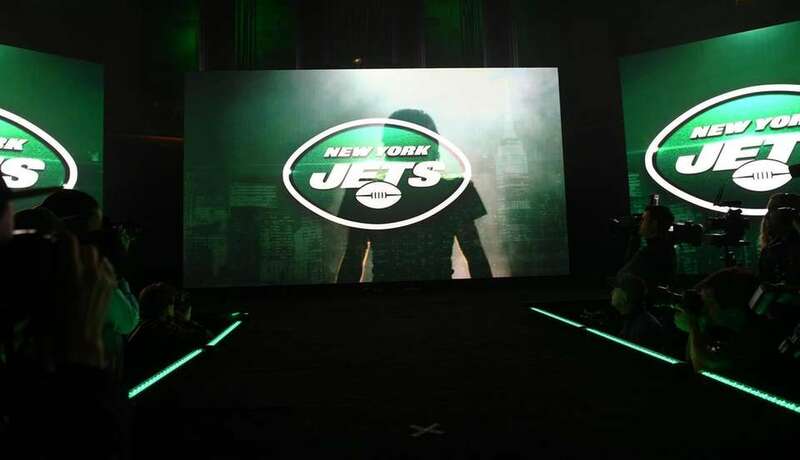 JB Smoove is the MC.